Kelowna Join CBC Radio’s Daybreak South and Radio West as they broadcast live from the Kelowna Rotary Centre to raise funds for Food Bank. Take part in the day’s event that includes poetry reading to belly dancing. Be a part of the 25th Annual Food Bank Day in Kelowna! 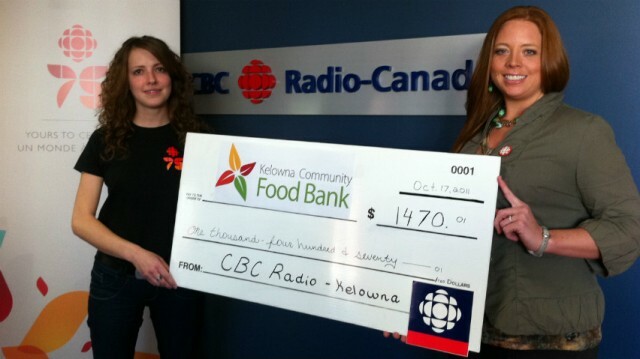 December 2 marks the 25th anniversary of CBC/Radio-Canada’s Food Bank Day. This year, Kelowna radio shows Daybreak and Radio West will be moving their shows down the street for a special live broadcast at the Kelowna Rotary Centre for the Arts at 421 Cawston Avenue. The Okanagan’s morning show, Daybreak, will be hosted by Chris Walker from 6 – 8:30 am on Radio One. Following the live broadcast is “Poetry ‘n Motion” a day-long event offering the public a chance to take part in everything from poetry reading to belly dancing. Then, starting at 3 pm, Rebecca Zandbergen hosts a special edition of Radio West. The public is encouraged to come down, join in the activities and make a donation to the Kelowna Food Bank. Site by Red Mill Creative Inc., Helping tell the Okanagan's and your stories.